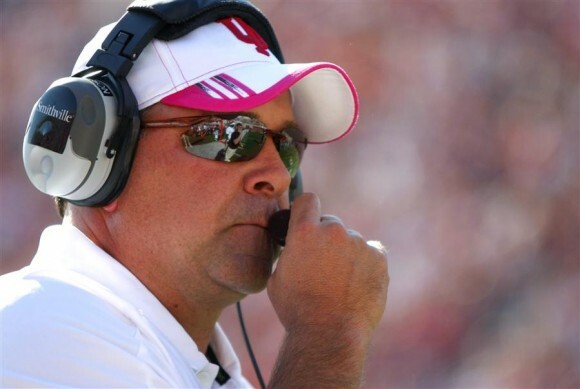 The 2014 edition of Inside IU Football with Kevin Wilson is on WSLM 97.9 FM each Wednesday evening at 8:00 p.m. The show is broadcast live from the Bloomington Holiday Inn. The call-in radio show is hosted by the Voice of the Hoosiers, Don Fischer, who is entering his 42nd season. Fans are encouraged to come and join Coach Wilson for the opportunity to ask questions during the show each and every Monday evening throughout the 2014 season. The Holiday Inn is located at 1710 N. Kinser Pike near the intersection of Kinser Pike and the 45/46 Bypass. If you can’t make it to Bloomington, the call-in number is 1-800-500-9422. The show can be heard live on Your Kentuckiana IU Sports Station – WSLM 97.9 FM.